I read this article and found it very interesting, thought it might be something for you. The article is called Farmer Suicides Up 42% In 2015, Second Consecutive Drought Year and is located at https://archive.indiaspend.com/cover-story/farmer-suicides-up-42-in-2015-second-consecutive-drought-year-43358. Suicides by farmers in India increased 42%, while those by agricultural labourers declined 32% in 2015, a second consecutive drought year after 2014, according to data on accidental deaths and suicides in India, released by the National Crime Records Bureau (NCRB) on December 30, 2016. Indebtedness was listed as the primary reasons for suicides by farmers (3,097), while “family problems” was the leading reason for suicides by farm workers (1,843). Suicides by farmers and agricultural labourers combined increased 2% over an year to 12,602 in 2015 from 12,360 in 2014. More farmers than agricultural labourers committed suicide in 2015–8007 farmers (64%) and 4595 farm workers (34%). In 2014, 54% were farm workers. More than 300,000 Indian farmers have committed suicide since 1995, the year NCRB began recording data on farm suicides. The average landholding declined 20% over 15 years, from 1.41 hectare in 1995 to 1.15 hectare in 2010, according to the latest agricultural census, Factly.in, a data journalism portal, reported in December 2015. These data indicate marginal farmers also work as farm workers, potentially blurring the distinction between farmer and farm worker. Farmer suicides reduced 32% from 2009 till 2013–a good monsoon year–after which they have increased every year. As many as 17,368 farmers and agricultural labourers committed suicide in 2009, a drought year nationwide. Suicides declined to 11,772 in 2013, rising 5% to 12,360 in 2014 and 8% over two years to 12,602 in 2015. For the seventh year in succession at least (data prior to 2008 are currently unavailable on the NCRB website), more farmers committed suicide in Maharashtra (4,291) in 2015 than any other state, rising 7% from 4,004 in 2014, followed by Karnataka (1,569) and Telangana (1,400). Karnataka registered a 100% rise with 1,569 suicides in 2015. Gujarat, Kerala, Rajasthan and Tamil Nadu were among the big states that reported a fall in farmer suicides. Farmer and farm worker suicides in Gujarat halved, from 600 in 2014 to 301 in 2015. Apart from indebtedness, which is the primary reason listed in the data, crop failure is the next leading reason listed in the suicides of 1,562 farmers in 2015. As many as 842 farmers reportedly committed suicide due to various illnesses, while 330 farmers killed themselves due to drugs and alcohol, according to the data. Suicides due to bankruptcy more than doubled to 3,097 in 2015 from 1,163 in 2014. Suicides after crop failure increased 60%, from 969 to 1,562 over the same period. Only four states–Maharashtra with 1,293, Karnataka with 946, Telangana with 632 and Andhra Pradesh with 154–among 29 states registered more than 100 suicides by farmers due to indebtedness. 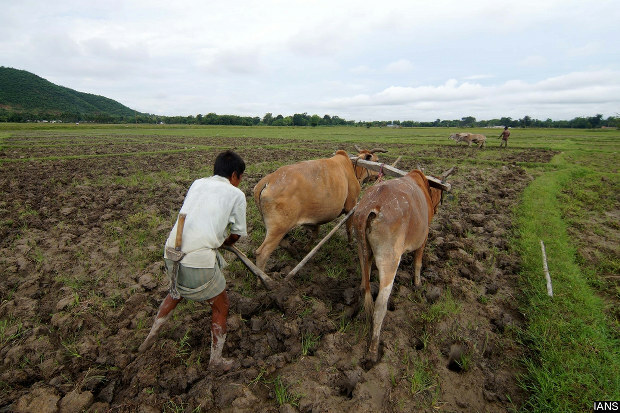 Of 12,602 farmers and labourers who committed suicide, 92% or 11,584 were male, while 1,018 were female. “Family problems” was the second-leading cause for suicides by women farmers, accounting for 18% of deaths reported. About 896, or 20% of suicides by agricultural labourers and 899, or 11% farmers suicides, were from ‘other causes’ and ‘causes not known’.